Most of the landscaping materials carried at a landscaping supply yard are considered "Hard" Landscaping Products. Hardscaping refers to the paths, walls, walkways, patio areas, or other permanent structures of your landscape design. Softscaping refers to the trees, plants, and flowers that are usually added after the hardscaping is completed. These are used to soften, accent, and complete the design. hardscaping usually requires heavy equipment, and almost always comes first in the installation process. One exception to this rule of hardscaping first is trees. These are often installed with the hardscaping. There are also certain situation where a yard has to be done in a particular installation sequence due to other factors like accessibility. Visit our article on landscaping planning for other helpful tips. Most of your softscaping products will be purchased at a nursery or garden center, but in some cases you may be able to purchase plants at your landscape supply yard. Likewise, you can also find hardscaping products at some garden centers and nurseries. Before we get into these products, let's do a quick recap of what we have covered in this series for those of you that are just joining us. You can click on the links at the bottom of this section to review some of the other materials that we have covered. So far, we have covered most of the natural and manufactured hardscaping supplies. Landscape wall bricks, blocks, paver bricks, larger feature rocks, boulders, gravel, decorative rocks, flagstone, edging, paver sands, and other related products. In this section we are going to look at soil, bark, colored mulches, and bagged products. 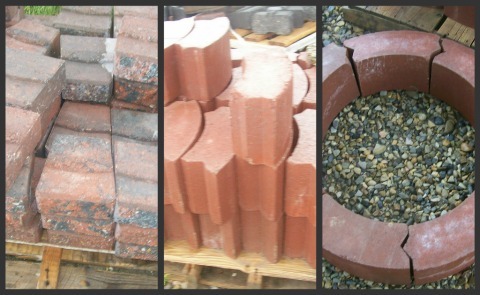 Many of the products associated with "Softscaping" We also are going to briefly mention a brick firepit ring. This section will complete the series. At Dream Yard, we are always trying to improve our site. If you feel there is a product you would like to see us add, please contact us and let us know. With an increasing number of do-it-yourselfers, landscape supply yards have implemented some great ways to provide products for their customers. Most yards can bag just about any product you want. By using large soil and supply bags, your products are better contained and protected from the elements until you are ready to use them. Photo compliments of Ornamental Stone. Topsoil or loam can be loaded into the top of a hopper, while a large strong tote bag is attached or held on the bottom. These tote bags usually hold around 1 cubic yard, and are delivered directly to the customers. They don't just hold soil either. Depending on the strength of the bags, they can also hold sand and gravel. Purchasing bulk quantities will save you a substantial amount of money and trips to a garden center. It can also save you from damaging your vehicle. If you need a truckload or just a couple of yards, your local landscape supply yard can deliver. We have talked before about how product names change with many landscaping suppliers. Many of them have their own special blends of soil, and their own name to go along with it. You will need to know what purpose you are using the soil for, so they can give you the right product. How many different terms have you heard associated with soils? Topsoil, loam, fill, garden soil, potting soil, mulch, peat, manure, and compost are all pretty common. This is also one of those controversial issues where definitions can be translated differently depending on where you live, and who you are buying from. Don't be discouraged, it's a little more simple than you think. Let's start by covering a few definitions to make things easier. Before we define soil types, we are going to give you a dictionary definition of the word fertilizer. There seems to be a misconception that fertilizer only comes in a bag and contains nitrogen, potassium, and phosphorus. Fertilizer is anything added to or in the soil to improve the quality or quantity of plant growth. Topsoil refers to the top 6 to 8 inches (Up to about 20 cm) of soil on the earth's surface. It is often rich in microbes and organics, which are beneficial in healthy growth of grass and plants. Fill is material brought in to raise levels without wasting good topsoil. This is often the material underneath the topsoil that is considered dead, or sterile. (Lacking in microbes and organics) It is mostly made up of dirt, rocks, and sand, and clay. It makes an excellent foundation for a beautiful lawn and garden. It holds nutrients, the right amount of moisture, but still drains well. Compost we could talk about this for hours, but we will simplify it for this section. Compost is decomposed organic matter. It can be used alone, as topdressing, or added to other blends. So, it is a type of organic fertilizer because it improves the quality of the soil. Potting and Garden soils are specifically designed blends of peat, sands, various composts, lime, and occasionally fertilizers. They are designed to create an ideal growing environment for plants, vegetables, or anything else you will find in a garden. 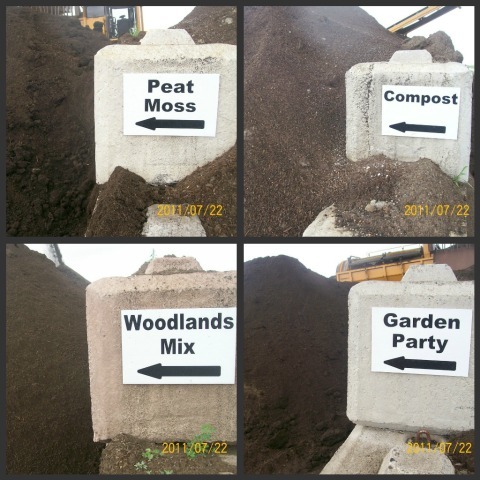 Peat is good for moisture retention, while manure, and other organics provide organic fertilizers, and nutrients for improvements to any type of soil. Landscape yards will add and mix their own blends of soils to provide you with a good base to start from. You may have to add more amendments yourself, depending on the requirements of what you will be growing. If you are installing a lawn, a good quality topsoil or loam should be fine. If you are interested in gardening, you may want to purchase one of their special blends to fill your garden beds with. This should makes things a little more simple for do-it yourselfers. Talking about garden soil takes a whole website in itself, but serious gardeners already have thousands of great garden sites to check out. There are many different types of mulch, and many of them are not purchased at a landscape supply yard. Straw, pine needles, recycled rubber mats, rocks, plastic sheets, bark, wood chips, sawdust, and compost to name a few. Let's start off with a brief description of what mulch is for the purposes of the do-it-yourself landscaper. Mulch is a protective barrier used around the home and garden to suppress weeds, moderate soil temperatures, and help retain moisture for plants, shrubs and trees. Care must always be taken when applying mulch. How much? what type? and why? are questions that should always be dealt with before you make your purchase. A helpful tip, is be careful using lighter mulch in very windy locations. (It can blow around). Applying mulch is another controversial subject because it is said it can sometimes cause more damage than good. For example: Acidic pine needles can affect the pH level of the soil, which in turn will affect the plants growing in it. Because of this, we suggest that you do specific research to each specimen you are planting when using mulch. This will give you the information you need, rather than general statements. This article is not about specifics, rather about the products that are carried at a landscape supply yard. Types of mulch and colors of mulch materials. These are the typical mulches you will see available at a landscaping supply yard. We have already covered these formulas in other sections of this series, but we will do a quick refresher for those who haven't seen them. Soil is usually sold by the cubic yard, so you must figure out how much you will need by accurately measuring your area to be filled. Length X width X depth = Cubic feet required. Convert this number to cubic yards by dividing by 27. Need help? Use our volume conversion calculator to convert from cubic feet to cubic yards. For more information on estimating go to our Quick Landscaping Estimating Reference for formulas and examples. It's not a difficult formula, but remember that it is an estimate only. There are many factors that must also be accounted for when estimating. If you are Seeding or Sodding a yard, we suggest you visit our how-to module for lot's of helpful tips on these factors. Compaction is the biggest one that you will deal with. It also depends on what equipment you have doing the compacting. Generally, I would order an extra 20 to 30 % more soil if you are sodding or seeding a yard. You are better off having a little bit more than a little bit less. Never cheap out on good soil, your lawn will thank you later. Estimating mulch uses the same formulas, but you don't have to worry about compaction like you do with loam. Firepits concludes our series on the products carried by most landscaping yards. There are different types of firepits you can build, from natural stones to manufactured firepit rings like below. Make sure the products you use are able to stand up to the heat created by the fire. Although flagstone makes for beautiful projects, it may crack or split from the heat. There are different firepit kits available on the market. Most companies that make them will have their own version. The kits are relatively affordable, easy to install, and they usually come with a screen. Firepit rings are the easiest to install for do-it-yourselfers. With any firepit make sure that you know your local regulations on construction before you buy. There can be by-law's or covenants that can set guidelines when you are installing your firepit. They are usually required to be a certain distance away from combustionable materials like houses, fences, or decks. They may also have specific sub-base requirements of gravel underneath your project. Some cities required 12 to 18 inches of gravel as a base for a firepit. These regulations are not to be taken lightly. They are put into place to protect everyone. If anything ever happened you may be liable for damages. Insurance companies may not be willing to stand behind you either. Check with your local municipal office or fire marshall for these regulations. It would be a shame for you to make such an investment if you could not legally have one in your yard. People that may not be able to legally have a "fire pit", can sometimes install a propane "firebowl" instead. Whatever your dream yard requires, we hope you enjoy this site, and find it a helpful tool in learning about any landscaping process. Please contact us with your feedback, or any questions you may have.